Lokomotiv Kuban Krasnodar improved its chances of reaching the playoffs from Top 16 Group F by downing Partizan NIS Belgrade 84-73 at home on Friday. 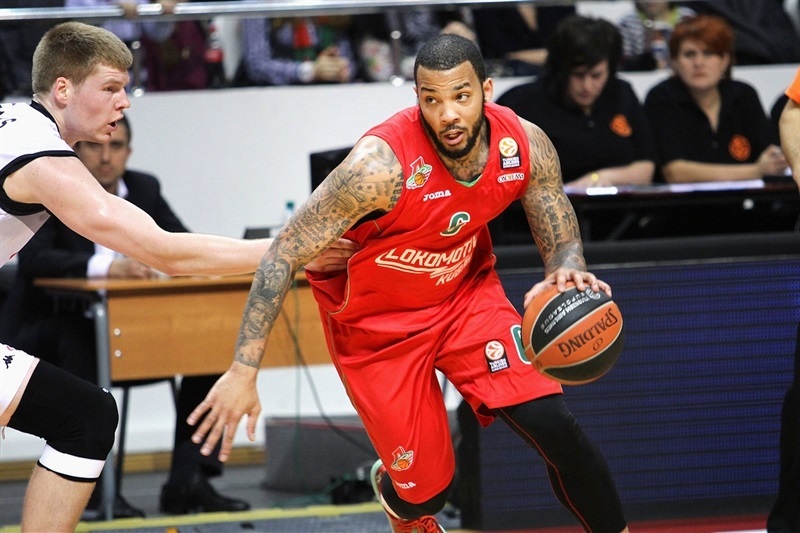 Lokomotiv improved to 6-6 and tied Galatasaray Liv Hospital for fourth place. Partizan dropped to 3-9 and was mathematically eliminated from playoff contention with the loss. Derrick Brown led the winners with 18 points on 6-of-6 two-point shooting plus 7 assists and 3 steals. Valeriy Likhodey added 15 points on 5-of-6 three-point shooting, Simas Jasaitis scored 13, Richard Hendrix 12 and Mantas Kalnietis dished 8 assists for Lokomotiv. Davis Bertans led Partizan with 20 points. Sasha Pavlovic added 13 for the guests. Brown and Krunoslav Simon fueled a 13-2 opening run that allowed Lokomotiv to keep a 16-10 lead after 10 minutes. Pavlovic, Bertans and Bogdan Bogdanovic brought Partizan as close as 33-30, but a three-pointer by Jasaitis and a layup by Brown restored a 38-30 Lokomotiv lead at halftime. Likhodey sank three shots from downtown in a 13-0 run that broke the game open, 51-35, midway through the third quarter. A dunk by Aleks Maric extended the hosts' lead to 67-45 early in the fourth quarter, allowing Lokomotiv to have plenty of time to celebrate an important win. Lokomotiv dished 29 assists, one shy of the all-time Top 16 record, which belongs to Khimki Moscow Region (30, 2012-13) and the second-best this season; Panathinaikos had 31 against Laboral Kutxa Vitoria in regular season action. Both teams struggled to score early until Hendrix stepped up with a jump hook. 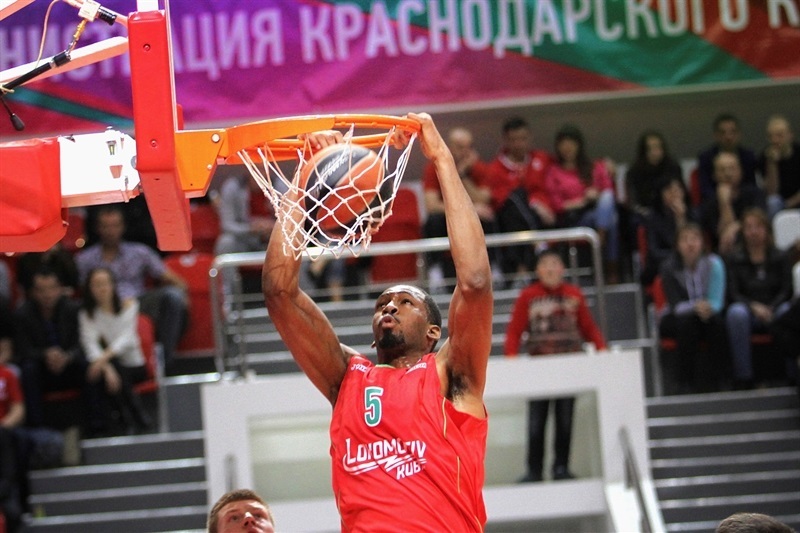 Hendrix kept pacing Lokomotiv with a one-handed floater, as Partizan kept accumulating missed shots and turnovers. Brown followed free throws with a wild alley-oop to cap an 8-0 opening run. Partizan missed its first 6 shots until Bogdanovic nailed a mid-range jumper. 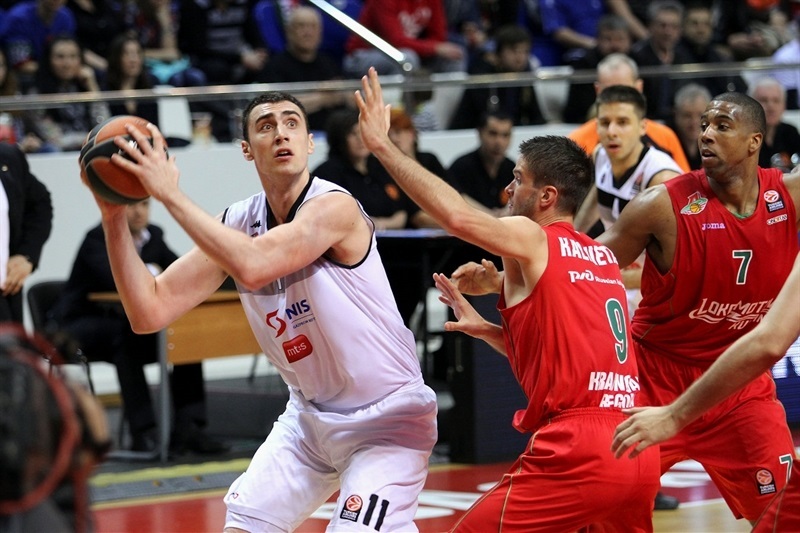 Simon shined with a reverse layup and soon added a three-pointer that caused Partizan to call timeout down 13-2. Nikola Milutinov hit a jump hook and Bertans struck from way downtown to close within 14-7. The guests tried a taller lineup featuring Bertans, Milutinov and Djordje Gagic together on court and Lokomotiv struggled to find answers on offense. Milenko Tepic split free throws and a wild reverse layup by Bertans kept the guests within 14-10. Free throws by Maric gave Lokomotiv a 16-10 lead after 10 minutes. 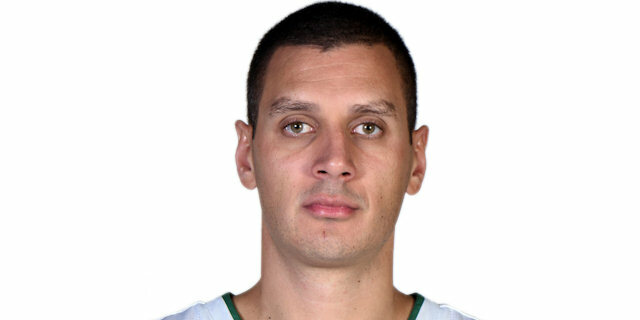 Kalnietis buried a corner three-pointer early in the second quarter and a two-handed dunk by Brown restored a 21-10 Lokomotiv margin. Likhodey also struck from downtown to cap a 10-0 run. Bertans and Marcus Williams traded triples and a layup by Tepic kept Partizan within 27-15. Pavlovic scored in penetration, but Maric answered with a layup. A three-pointer by Bogdanovic got Partizan within single digits, 29-20. Pavlovic shined with a driving basket, which Hendrix erased with an easy slam. Bogdanovic scored around the basket and a power layup by Joffrey Lauvergne brought Partizan as close as 31-26. After Dejan Musli made free throws, Hendrix dunked again. Bogdanovic scored to keep the guests within 33-30. Jasaitis hit his trademark corner triple and Brown added a buzzer-beating layup to give Lokomotiv some fresh air, 38-30, at halftime. Pavlovic took over with a dunk-and-foul immediately after the break and soon added free throws to keep Partizan as close as 38-35. 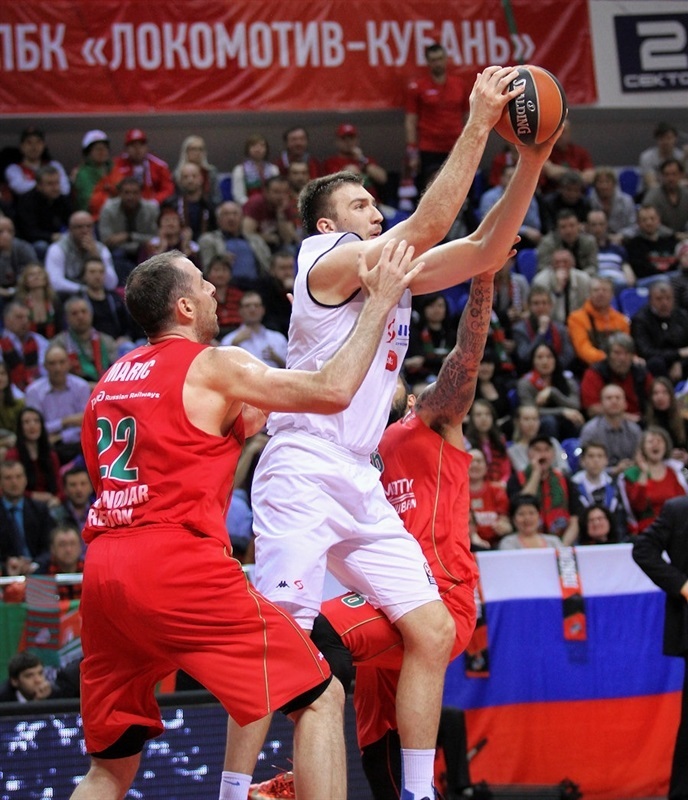 Lokomotiv was held scoreless for almost two minutes until Likhodey swished a corner three-pointer. Kalnietis provided a highlight with a coast-to-coast layup and another triple by Likhodey ignited the crowd at 46-35. Brown sank his trademark jumper from the top of the key, before Partizan called timeout at 48-35. 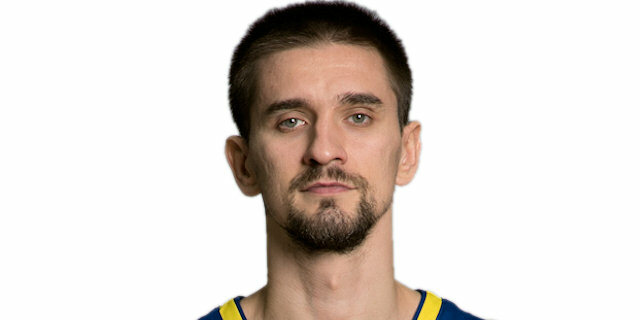 Likhodey hit another three-pointer which touched the trim, went up and fell down to cap a 13-0 Lokomotiv run. Tepic hit free throws, but Jasaitis nailed a triple. A layup by Bertans made it 54-39. Gagic tried to change things with a dunk, but Jasaitis did better with a reverse layup and another one from beyond the arc. After Gagic scored again, Williams shined with a driving layup. Lauvergne scored for the visitors, but a layup by Brown fixed the score at 63-45. Anton Ponkrashov split free throws early in the fourth quarter. Brown took over with a big block and a dunk by Maric made it a 22-point game. Milutinov slammed in traffic, before Ponkrashov scored again. A layup by Pavlovic got Partizan a bit closer, 69-49. Bertans scored around the basket, but Lokomotiv stayed really active on defense. Brown scored off a steal, but Bertans nailed a three-pointer. A dunk by Hendrix kept the hosts way ahead, 74-54, with over four minutes left. A red-hot Bertans followed a triple with a layup and Lokomotiv called timeout at 74-59. Free throws by Hendrix and a second-chance layup by Jasaitis sealed the outcome, 78-59. Milutinov shined with a tip-in, but even though Partizan never gave up, Lokomotiv kept full control of the game and cruised to a well-deserved win. 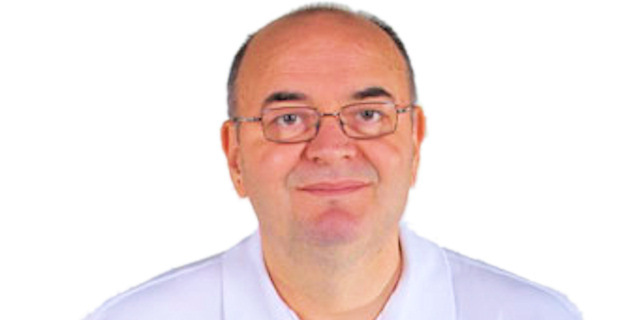 "Partizan is a good team that loves contact, loves playing physical. But we were able to lead from the start playing aggressive on defense and always moving the ball. Partizan were packing the paint and our shooters Likhodey, Jasaitis and Simon punished them for that. We wanted to build a bigger lead towards the end of the game, but weren't able to maintain the same level of concentration. Still we've beaten a strong team and it's another victory that brings us closer to the playoffs." "I want to congratulate Lokomotiv on this win and thank the Krasnodar fans for the warm welcome. Lokomotiv is a better team now. It was obvious in how they defended in pick-and-roll situations. 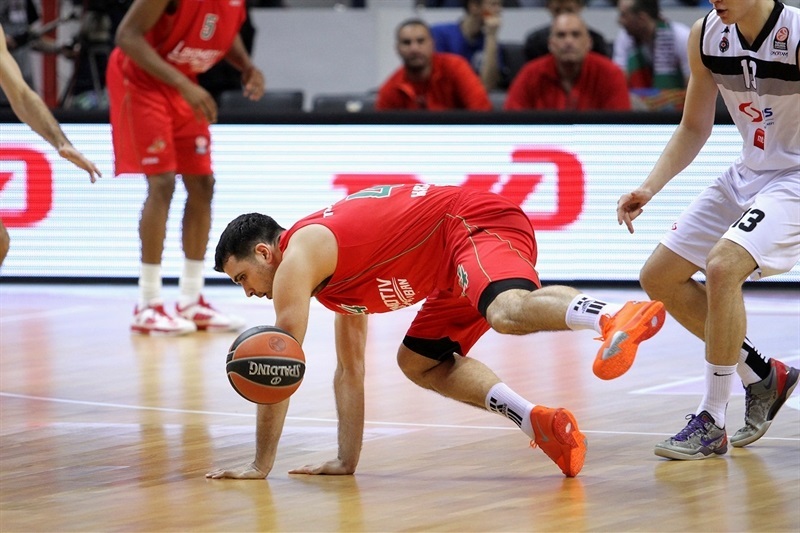 We couldn't do the same, letting Likhodey take open shots far too many times just like in our first game in Belgrade. Our focus is now on the Adriatic League and maybe half of our concentration was reserved for Monday's game against Cedevita. " "It was a classy game. Wish we had more of these. But there are two crucial matches ahead which we should get ready for right away. It's a little pity we couldn't build a bigger lead and lost our pace towards the end for some reason. Still we should be happy with a quality win after a long stretch of losing and winning by 1 point. " "Our plan was to win this game. In the first half, we started really bad, but then were able to get back. 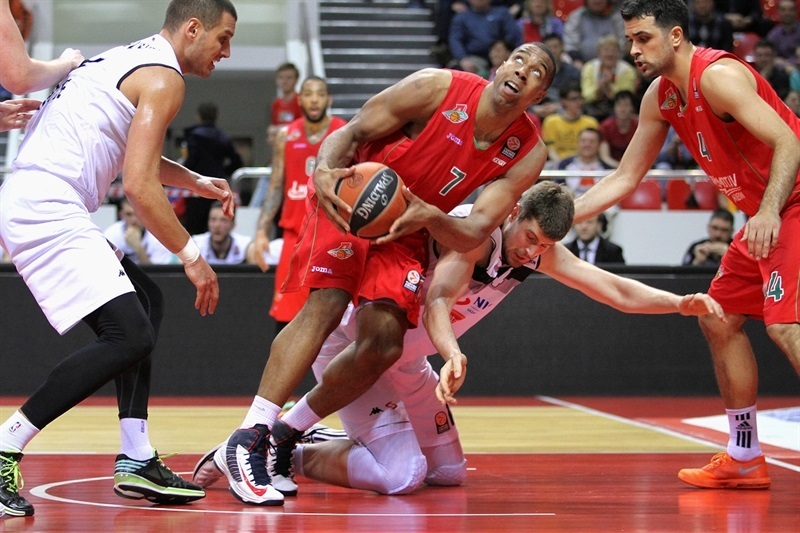 At the start of the second half, Lokomotiv built a 15-point lead and it was too much for us to overcome. "